Fibronectin Binding Protein A (FnBPA) is an invasin from Staphylococcus aureus that allows this pathogen to internalize into eukaryote cells. It was previously demonstrated that recombinant Lactococcus lactis expressing FnBPA were invasive and able to transfer a plasmid to eukaryotic cells in vitro and in vivo. In this study, the invasivity of recombinant strains of Lactococcus lactis that express FnBPA under the control of its constitutive promoter or driven by the strong nisin inducible expression system (NICE) were studied. It was demonstrated that the nisA promoter allows an increase of FnBPA expression on the surface of Lactococcus lactis surface, as shown by flow cytometry, which subsequently enhanced internalization and plasmid transfer properties in vitro in Caco2 cells and Bone Marrow Dendritic Cells. In vivo, the use of nisA promoter increase the plasmid transfer in cells of both the small and large intestine of mice. FnBPA expression at the surface of recombinant L. lactis is positively correlated to internalization and DNA transfer properties. The recombinant strains of L. lactis that expresses FnBPA under the control of the nisin inducible expression system could thus be considered as an improved tool in the field of DNA transfer. DNA delivery by lactic acid bacteria (LAB) is a topic that has been the focus of an increasing amount of research groups, not only for its potential use for vaccination purposes, but also as a mean to deliver bioactive compounds directly in the gastrointestinal tract [1-6]. In this regard, a promising advance has been the development of a system based on a new vector for DNA delivery using lactococci, named Vaccination using lactic acid bacteria or pValac . This plasmid harbours an eukaryotic region containing the CytoMegaloVirus promoter (pCMV) under which the gene of interest can be expressed, the polyadenylation signal of Bovine growth hormone (BGH polyA) which is required for gene expression by eukaryotic host cells, a prokaryotic region containing the RepA/RepC replication origins for both Escherichia coli and Lactococcus (L.) lactis, and a chloramphenicol resistance gene (Cm) for bacteria selection. In order to allow expression of the genes of interest by eukaryotic cells, such as those of the gastrointestinal tract, these DNA delivery vectors must be effectively incorporated into these cells. An interesting way to achieve this latter objective is to take advantage of the mechanisms used by invasive pathogens. Pathogenic bacteria can be internalized by eukaryote cells by using invasins expressed on their cell surface  such as the Fibronectin Binding Protein A (FnBPA) stemming from Staphylococcus (S.) aureus, the Internalin A from Listeria monocytogenesis[10,11], or the invasin of Yersinia pseudotuberculosis[12,13]. Thus, these proteins possess the potential to be used as tools in genetic engineering for the design of invasive bacterial strains developed from non-pathogenic strains considered "GRAs" (Generally Regarded As Safe) for human health, such as the model LAB, L. lactis. In the particular case of FnBPA, the internalization process involves three molecules including the bacterial FnBPA, the fibronectin synthesized by the host, and a clustering of integrins from the host cell surface. The binding between these three entities results in the bacterial uptake by the eukaryote host involving tyrosine phosphorylation and actin rearrangement . The role of FnBPA in cell internalization using L. lactis has been previously described by Que et al. [15,16]. This process has been used in the design of recombinant bacterial strains expressing FnBPA with varying results, thus we hypothesized that an increase of the external expression of the invasin could improve the functionality of the DNA delivery system. One method of accomplishing this goal would be to use a strong heterologous promoter such as the nisA gene promoter which has been described as being one of the most efficient promoters used during the last years [17,18]. The nisA promoter is derived from the Lactococcus lactis nisin gene cluster where nisin is considered as an outside inducer that requires the control of the nisK and nisR gene regulators. This strategy could improve current constructs and improve DNA delivery in eukaryote cells. The objectives of this work were to construct a Lactococcus lactis strain expressing the FnBPA gene under the control of the nisA promoter and evaluate if this new construct was able to increase FnBPA expression compared to the use of constitutive FnBPA promoter and consequently improve bacterial internalization and nucleic acid transfer in eukaryotic cells in vitro and in the gastrointestinal tract of mice. Plasmid pNisFnBPA was obtained by placing the fnbpA gene of S. aureus, without its constitutive promoter, but under control of the nisA promoter (PnisA). The backbone of this construction is provided by the pOri253 plasmid allowing resistance to erythromicyn. The final plasmid pNisFnBPA was used to transform the L. lactis NZ9000 wild type strain, resulting in LL-pNisFnBPA strain, since this strain, a derivative of L. lactis MG1363, contains the nisRK gene necessary for the expression of genes downstream of the nisA promoter in the presence of sub inhibitory concentrations of nisin. FnBPA expression at the surface of LL-pNisFnBPA and LL-FnBPA was analyzed by fluorescence-activated cell sorting (FACS) using anti-FnBPA antibody after nisin induction. An increase of FnBPA expression in the range of 55% is observed in the strain with FnBPA expressed under the control of nisA promoter (Figure 1), compared to the strain with the constitutive promoter. Different concentrations of nisin were used for induction (0, 0.1, 1.0, 2.5, 5.0, and 10 ng/ml), and it was shown that the best results were obtained with the highest concentration used (10 ng/ml, data not shown) which is in accordance to the optimal concentrations for the expression of genes of interest in the description of this system . FnBPA expression at the surface of LL-pNisFnBPA and LL-FnBPA as analyzed by flow cytometry where the secondary antibody was labeled with FITC. Results are expressed as means - standard deviation. a-bMeans with a different letter are significantly different from each other with a p≤0.05. The recombinant strains LL-FnBPA and LL-pNisFnBPA were co-incubated with Caco2 cells or bone marrow derived dendritic cells (BMDCs), as well as two control L. lactis wild type strains (LL-NZ9000 and LL-MG1363). The bacterial invasiveness was then defined by the ratio between internalized bacteria, determined by colony forming units observed after cell lysis and plating, and bacteria input for co-incubation. Figure 2 shows the invasiveness levels obtained with the four L. lactis strains using Caco-2 and BMDC cellular models, respectively. In the Caco-2 cell model, it can be noted, that the invasive LL-FnBPA strain allows greater invasiveness levels (between 3 and 6 times) than the control strains. This invasiveness value can even reach a 10 fold increase in the case of BMDCs model. Moreover, in both cellular models, the LL-pNisFnBPA strain exhibits invasiveness levels 3 to 4 times greater than the LL-FnBPA strain. Therefore, the increase of FnBPA expression on the outside bacterial membrane can be related to an improved internalization ability in eukaryote cells in vitro. In vitro invasiveness assays of LL-NZ9000, LL-MG1363, LL-FnBPA and LL-PnisA-FnBPA strains in A) Caco-2 cells and B) BMDCs. Results are expressed as means - standard deviation. a-cMeans with a different letter are significantly different from each other with a p≤0.05. In an attempt to compare the DNA transfer properties in vivo of LL-FnBPA and LL-pNisFnBPA, the pValac plasmid containing the gfp gene  was used to transform these strains, thus obtaining strains denominated LL-FnBPA-GFP and LL-pNisFnBPA-GFP, respectively. The subsequent oral administration of mice with LL-pOri23-GFP, LL-FnBPA-GFP or LL-pNisFnBPA-GFP allowed us to evaluate the effect of FnBPA expression on DNA delivery as observed by the presence of fluorescence (GFP expression by pValac:GFP) in the small and large intestine tissues, 24 hours after administration. The importance of FnBPA in the DNA delivery was observed mainly in large intestine. Mice that received LL-FnBPA-GFP showed significant increases (P < 0.05) in the number of fluorescent cells compared to the mice that received LL-pOri23-GFP (Figure 3). The improvement of the delivery system with the addition of the promoter pNisA to increase the expression of FnBPA was also demonstrated. Mice that received LL-pNisFnBPA-GFP strain showed the highest number of GFP positive cells in both small and large intestines (Figure 3); however, when comparing this strain with LL-FnBPA-GFP, a significant higher number of fluorescent cells was (P < 0.05) only observed in the large intestine (Figure 3). Number of fluorescent cells in the A) small or B) large intestines of mice orally administered with LL-pNisFnBPA-GFP, LL-FnBPA, LL-pORI-GFP, LL-FnBPA-GFP. On the left is represented the number of fluorescent cells determined in 10 fields of vision and when a significant difference was observed, the p values were places. On the right are representative histological slides observed at different magnifications using a fluorescent microscope. Fluorescent cell counts are in favor of a more efficient DNA transfer associated with the LL-pNisFnBPA-GFP strain, where the FnBPA gene is under the control of the nisA promoter, compared with the native promoter LL-FnBPA-GFP strain, and the control LL-pOri23-GFP strain without FnBPA. In this study, the design of a particular Lactococcus lactis strain expressing FnBPA on the external membrane under the control of the strong inducible nisA promoter was described. This so-called LL-pNisFnBPA strain was studied for its properties to improve DNA delivery in vitro on eukaryote cell models, as well as in vivo in mice intestinal tract. This recombinant strain was obtained from the transformation of the wild type L. lactis NZ9000 strain, since it contains the nisR and nisK genes which are needed for the regulation of the expression system based on the nisA promoter [18,19]. A sub-inhibitory nisin concentration (10 ng/ml) was used for the overnight induction of the LL-pNisFnBPA-GFP strain allowing then a 55% gain regarding FnBPA expression compared with LL-FnBPA where FnBPA production is under the control of its constitutive promoter. This shift is in agreement with the nisA promoter strength already described where the efficiency of the nisA promoter is compared to other promoter in Gram-positive bacteria . It is now well established that LL-FnBPA recombinant strains exhibit good properties of internalization in Caco-2 cells as can be observed by GFP expression plasmid delivery  or through the expression of BLG in vivo. Here, we confirmed this capacity in vitro on Caco-2 cells and showed in addition that an enhancement of FnBPA expression, by the use of LL-pNisFnBPA strain, resulted in an increase of invasiveness level of 4 to 5 times compared to the LL-FnBPA strain. Moreover, we showed for the first time that FnBPA production at the surface of LAB increase invasiveness in BMDCS. Both strains LL-FnBPA and LL-pNisFnBPA showed higher invasiveness in BMDCs than in Caco-2 cells compared to non-invasive LL strain. This observation can come close to the fact that pathogenic bacteria uptake by dendritic cells also involves the DC maturation stage independently of the invasin . The increase of FnBPA expression is directly related to the higher invasiveness level associated to the LL-pNisFnBPA strain when co-incubated with Caco2 cells or BMDCs. An in vivo study was also performed (Figure 3) using the pValac delivery system with GFP being used as the indicator of DNA delivery and expression. The effectiveness of this DNA delivery system was demonstrated previously in healthy mice that received LL-FnBPA-GFP  and also in a TNBS-induced colitis mouse model, where the delivery of IL-10 DNA was evaluated using LL-FnBPA-IL10 . In both animal models, the recombinant L. lactis strain expressed FnBPA under its own constitutive promoter. Here, it was observed that the expression of FnBPA under Nis A promoter increased the DNA delivery in the intestinal tract of mice that received LL-pNisFnBPA-GFP, compared to the mice that received LL-FnBPA-GFP. The transit of L. lactis in the digestive tract has been especially described . It turns out that L. lactis does not colonize the gastrointestinal tract and exhibits a low survival in the gut. As a matter of fact, if L. lactis is resistant to gastric acidity it can be noted that less than one third of the orally administrated bacteria survive in the duodenum. So, the expression of FnBPA can help to the DNA delivery by this LAB. This was confirmed in the present work where we detected increased DNA transfer in the cells of small intestine, and even more in the large intestine of mice following the administration of recombinant L. lactis strains that expressed FnBPA (LL-pNisFnBPA-GFP and LL-FnBPA-GFP), compared to the animals that received L. lactis without the fnbpa gene (LL-pOri23-GFP). It is also important to note that DNA delivery in the intestine was increased by the use of pNisA promoter in the recombinant strain as a replacement to the constitutive promoter used in other studies. The animal model used in the present work did not show any adverse secondary effect in the mice that received the recombinant strains; however, considering that this experiment consisted in only 24 h, new experiments to evaluate the safety of this new recombinant strain are currently under way using healthy animals and also animals with some specific intestinal pathologies such as induced Crohn’s disease and colon cancer models. One of the immunotherapy research fields is looking for adapted bacterial vectors as DNA vaccine carriers [25-27]. In this report, we describe the design of a L. lactis recombinant strain where the expression of FnBPA, the invasin from S. aureus, is driven by the nisA promoter. We showed that this L. lactis strain provides an improved tool for bacterial invasiveness and DNA transfer as can be observed by co-incubation with Caco2 cells or BMDCs, as well as by GFP expression in small and large intestine after orally administration of recombinant strains that expressed pValac:gfp. Therefore, these results highly suggest that the enhancement of FnBPA expression on the bacterial membrane through the engineering of a promoter system is directly correlated to the increase of DNA delivery properties, which is a good illustration of the knowledge acquired in the field of DNA vaccine or the production of other beneficial proteins. The pSEC-E7 plasmid containing the nisA gene promoter was used to provide the corresponding fragment by digestion with BamHI and BglII enzymes. In addition the BamHI FnBPA gene fragment, without its constitutive promoter, was recovered by a BamHI digestion of a pORI23 plasmid containing the FnBPA gene (Table 1). This FnBPA fragment was then inserted in the pORI253 plasmid linearized with Ecl136II. The resulting construction was subsequently linearized by SalI digestion for the insertion of the nisA promoter upstream FnBPA to produce the Pnis-FnBPA plasmid. The cloning region was sequenced after each stage of the construction for orientation control. Human colon carcinoma cell line (Caco-2, ATCC), were routinely grown in 25 cm2 plastic flask (Costar) in DMEM, 10% SBF, 2 mM L-glutamine, 0.1 mg/L streptomycin, 100.000 U/L penicillin and 1 mM sodium pyruvate. Cells were kept at 37°C in 5% CO2, 90-95% humidity, trypsinized weekly (0.25% trypsin, 5 mM EDTA in Ca-Mg-Free Hanks’ balanced salt) and seeded onto new flask (1/10, v/v). Murine bone marrow dendritic cells (BMDCs) were generated from bone marrow (BM) progenitor cells isolated from femurs and tibias of BALB/c mice as previously described , with minor modifications. Briefly, after red cell lysis (ammonium chloride 0.14 M, pH 7.2), BM cells were cultured in Petri dishes at 2 × 105 cells/mL in complete Iscove’s Modified Dulbecco’s Medium (IMDM, Sigma, St. Louis, USA) supplemented with 10% (v/v) heat-inactivated fetal calf serum (FCS, Gibco-BRL, Paisley, Scotland), 50 μM 2-mercaptoethanol, 1 mM glutamine, 50 μg/mL gentamycin and 20 ng/mL of recombinant mouse GM-CSF. Freshly prepared medium was added every three days and BMDCs were used on day 11 of culture (maximum of CD11c expression as checked by FACS analysis). L. lactis strains were cultured in M17 medium containing 0.5% glucose (GM17) at 30°C without shaking. Plasmids containing pNisA-FnBPA genes were transferred to L. lactis NZ 9000 by electroporation as previously described [31,32]. After preliminary tests, pValac-GFP plasmids were also introduced in L. lactis containing pNisA-FnBPA by the same way. Antibiotics were added at the indicated concentrations as necessary (erythromycin 5 μg/mL, chloramphenicol 10 μg/mL). Strains and plasmids used in this work are listed in Table 1. All experiment with the strain containing the fnbpA gene under the control of pNisA was performed using nisin (10 ng/mL; Sigma) as previously described  with some modifications. Briefly, overnight cultures in GM17 medium were diluted 1:20 and bacteria were grown until they reached an OD600 = 0.5, then nisin was added and bacteria grew for another 16 hours. To compare FnBPA levels, each strain was washed and resuspended in PBS, 1 × 105°CFU were incubated with 500 μl of primary antibody (1/1000 anti-FnBPA α produced in rabbit  for 1 hour at 4°C. Pellet was washed with phosphate buffered saline (PBS) solution 0.01 M, pH 7.4 and the secondary antibody was added (1/100 - FITC conjugated affinity pure Fab fragment goat anti-rabbit IgG (H + L)) followed by incubation at 4°C during 1 hour. Samples were washed again and analyzed by flow cytometry (BD Accuri Flow Cytometer). Data were analyzed using CFlow Plus software. In vitro invasiveness assays were performed as previously described [5,7,34] using the human colon carcinoma cell line (Caco-2) or murine bone marrow dendritic cells (BMDCs). Cells were cultured as described above, and distributed in P12 dishes (4 × 105 cells per well), bacteria were added to mammalian cells with a multiplicity of infection (MOI) of 103 bacteria per cell in medium without antibiotics. After two hours of co-incubation, cells were carefully washed three times with PBS and treated with gentamicin (150 μg/mL) for two hours in order to kill extracellular bacteria. Cells were washed again and disrupted (sterile PBS 1X + 0.2% triton, 4°C during 10 minutes), colony forming units (CFU) were counted after plating serial dilutions of these cells. All experiments were done in triplicate. 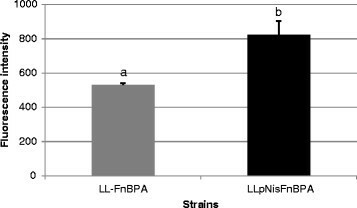 Bacterial strains were grown and prepared as described above with 10 ng/ml of nisin for induction in all strains (which is a sub inhibitory concentration but induces expression in the pNisFnBPA containing strain). 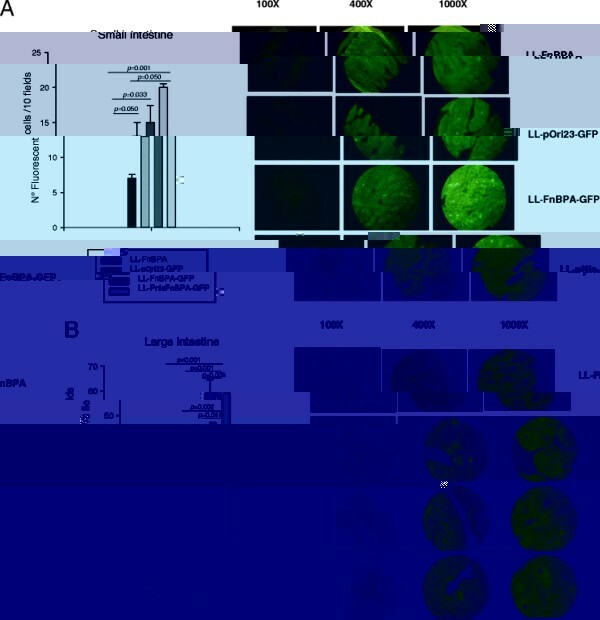 LL-FnBPA was used as control without GFP; LL-pOri23-GFP and LL-FnBPA-GFP were used to evaluate the possible benefit in DNA delivery related to FnBPA expression, and LL-pNisFnBPA-GFP was used to examine the effect in DNA delivery related to increased bacterial invasiveness. Six-week-old female BALB/c mice weighing 20-25 g were obtained from the inbred closed colony maintained at CERELA (Centro de Referencia para Lactobacilos, San Miguel de Tucum′n, Argentina). Three mice per group were fed by gavage with each bacterial suspension (108UFC/mouse) orally using a gavage syringe. After 24 h of administration, mice were sacrificed by cervical dislocation and small and large intestines were removed, washed with PBS and prepared for histological evaluation using standard techniques. Serial paraffin sections (4 μm) were made and after deparaffinization were mounted in glycerol/PBS (9/1) solution and observed using a fluorescence light microscope. The number of fluorescent cells was counted by two different researchers (two individual blind counts per sample) and the results were expressed as the mean number of positive cells counted in ten fields of vision as seen at 1000 × magnification. Fluorescent intensity was analyzed using data from Accuri - CFlow Plus and GraphPad Prism 5.00 (Unpaired t test). Invasiveness assays were also analyzed by means of and GraphPad Prism 5.00 using Bonferroni’s Multiple Comparison Test. For animal trials, the test and control groups contained 3 animals and the experimental protocol was performed two times (no interactions between these two trials were observed) and all the results (from the two trials) were analyzed together (N = 6). Statistical analyses were performed using MINITAB 15 software. Comparisons were accomplished by an ANOVA general linear model followed by a Tukey’s post hoc test. The Animal Protection Committee of CERELA preapproved all animal protocols and all experiments complied with the current laws of Argentina. JA, DM, AML, SC and RM carried out all experiments. VA and AM helped to draft the manuscript. PL, JGL and JMC conceived and coordinated the study. All authors read and approved the final manuscript. We thank Véronique Robert for kindly preparing cell lines. Authors would like to thank the Consejo Nacional de Investigaciones Científicas y Técnicas (CONICET), Agencia Nacional de Promoción Científica y Tecnol gica and ECOS-SUD-MinCyT for their financial support. Juliana franco Almeida was granted with a fellowship from the french-brazilian CAPES-COFECUB 720/11 project.